New jewelry can be found lower on this page. Contact me if you're interested in purchasing one of the pieces. I have a new philosophy this year: I love to make jewelry and you love to wear my jewelry so, I'm lowering prices! This way, I can make more jewelry and you can enjoy more! There's a lot more jewelry than I have online but you'll have to come to a show to see! Set in sterling silver with copper and alexandrite, this Chinese turquoise piece turns heads. Pendant $88. 16 inch chain, not sterling, $20. Large sterling silver earrings complete with stars, turquoise and spiney oyster. Not for the feint of heart. $78. Quartz points and Thai Hilltribe silver with a heavy duty sterling silver toggle clasp. $149. Annie wears greenish and brown turquoise. She loves amber too! The large donut is actually made from polymer clay with a few bits of polymer turquoise added for interest. Knotted on Irish linen. So many fun beads on a pair of artisan earwires of sterling silver. Bronze and brass, Indonesian beads, druzy sparkles little leaves, cobaltian calcite druzy and amber. Bia has strength and power! Beautiful! $68. 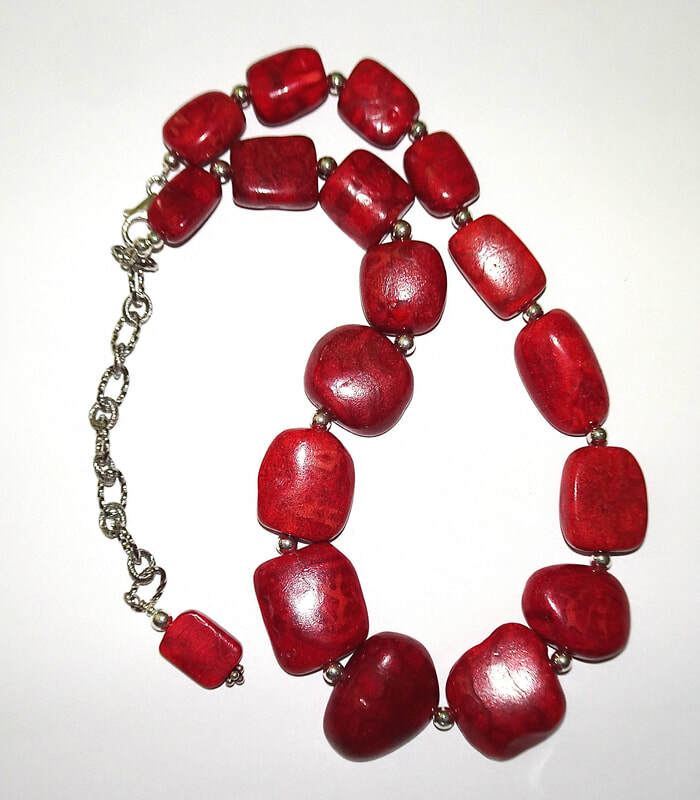 Recycled coral pieces that have been melded together with acrylic and cut into beautiful stones. The coral is set in sterling silver with posts. $68. Recycled coral at it's best. Coral pieces are held together with a dyed acrylic syrup. Left to dry, The product can be cut into a variety of shapes and sizes. These freeform nuggets are spaced with sterling silver. Sterling silver clasp. $45. Not only is Amaterasu the queen of all nature, she is also the goddess of the sun and ruler of heaven. Feel like a goddess with this earthy serpentine necklace knotted on gold Irish linen thread. The "S" clasp is sterling with a 22kt gold finish. $60. Roman glass, from the time of Jesus, is found in Israel. This piece, from Jerusalem, was the bottom of a glass jar or vase. Ceramic metalized beads from Mykonos, Greece and large black freshwater pearls make a strong statement. With extender and earrings. $89. For dog lovers! A loved dog is a hero. Greenish blue turquoise, hand knotted on waxed linen thread with a copper and brass pendant. The clasp is sterling silver. So pretty! $75. Frida loves to paint. The colors are day and night knotted on Irish linen thread. Thanks Frida! $60.